This process is especially recommended for self-realization in this age. By performance of Samkirtan, one can achieve the perfection of human life, and the process is so simple that anyone can take it up without qualification. Lord Chaitanya Mahaprabhu, an incarnation of Krishna, advented Himself on this planet 500 years ago in India for the purpose of delivering the conditioned souls from the clutches of material nature. Lord Chaitanya’s appearance in the Age of Kali has particular significance because His purpose was to introduce, by His personal teachings, the most practical means of self-realization in this age—the performance of Samkirtan. Lord Chaitanya, accompanied by His associates, spread the transcendental sound vibrations of Hare Krishna throughout India by holding Samkirtan in the streets of the cities. 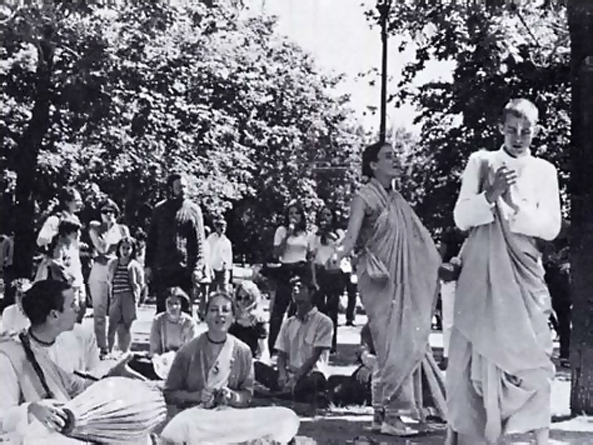 His purpose was to reach the mass of people, and in this respect His unique movement was in contrast with temple worship, for in this way anyone anywhere could benefit from the transcendental sound vibrations of Hare Krishna. His Divine Grace A.C. Bhaktivedanta Swami, spiritual master of ISKCON, is in the line of disciplic succession from Lord Chaitanya. 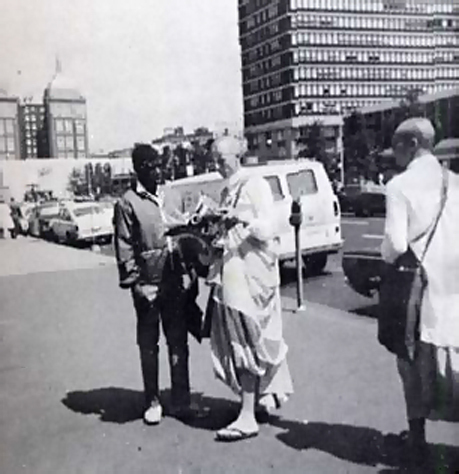 Under the directions of his spiritual master, he has come to America to spread the Samkirtan movement to the Western world. 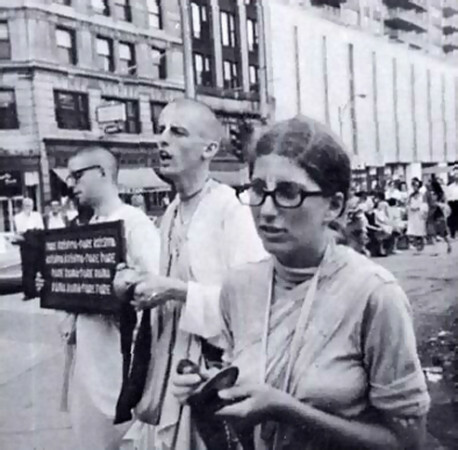 His Divine Grace has instructed his disciples to follow the example of Lord Chaitanya in chanting Hare Krishna in the streets of the cities and preaching Lord Chaitanya’s message of Samkirtan. By following these instructions, the Society, which began as a storefront on the Lower East Side of New York City, has grown to include twenty centers in major cities of the West. Each day a Samkirtan party from each center goes out into the streets of its respective city to chant Hare Krishna, accompanied by traditional instruments including mridunga (Indian drum) and kartals (cymbals), and to distribute literature about this important movement. 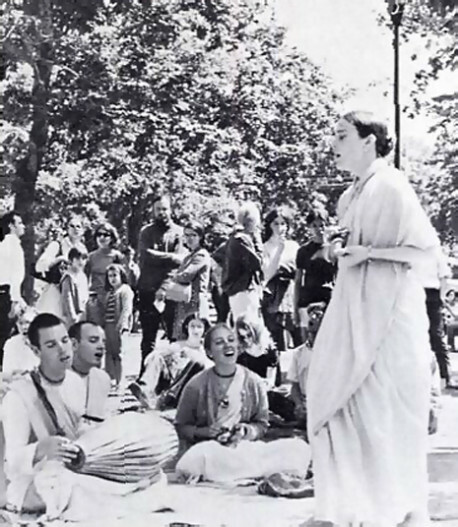 His Divine Grace says that Samkirtan is the life and soul of the Hare Krishna movement, and we, his disciples, can appreciate this insight by practical experience. 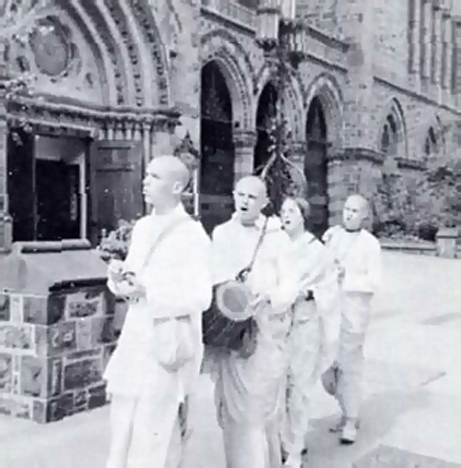 Membership is rapidly increasing, and many people are taking up the charting of Hare Krishna due to the influence of Samkirtan. This process can be adopted by anyone at any stage of life, for anyone can chant Hare Krishna. Although simple to perform, this Samkirtan movement can bestow upon its sincere followers the perfection of life.